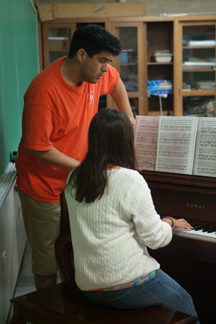 The piano department offers students a variety of enriching and rewarding experiences for young performers. All piano students participate in chamber music, rehearsing and performing quartets and quintets with students from the AFA Conservatory Orchestra. Pianists also receive individual coaching and lessons from the AFA Piano faculty and participate in a variety of master classes and enrichment courses designed to improve their skills in individual and group performance. Most piano students participate in chamber music. Students receive daily coaching from the AFA faculty and rehearse music from the standard repertory and a limited amount of contemporary and new works. Three chamber music concerts and, as needed, a series of in-house recitals give students valuable experience rehearsing and performing in small ensembles. The repertory played by these groups is demanding and requires a high level of sight-reading and performance proficiency. In order to facilitate the learning process, piano students receive their chamber music in advance so that they may begin to practice the music before the beginning of the Conservatory. Typically, music for pianists is mailed out 2-3 weeks in advance. All piano students receive a minimum of five private lessons during the festival. Due to the limited amount of time students have with private teachers, AFA suggests that students come prepared to address any specific issues with which they may desire assistance. Items students may wish to address with private teachers include, but are not limited to, rehearsing and preparing chamber music repertory, specific technical questions or concerns, receiving coaching on a solo or concerto movement they are preparing or rehearsing for upcoming contests and/or competitions. This type of focused, one-on-one interaction between working musicians and AFA students is specifically designed to help AFA students address individual musical goals. Taught by a rotating faculty, pianists take part in repertory class where they receive a thorough introduction to piano literature. Pianists are also enrolled in sight-reading classes and technique master classes. All full-time piano students are eligible to compete in the AFA Concerto Competition. The Competition is judged in two divisions: 1) Strings, Piano, Harp and 2) Winds, Brass and Percussion. Application forms are mailed with enrollment packages after acceptance into the Conservatory and the competition will be held during the second week of the program.